The Pelsis Concept range is made up of seven luxurious fragrances bringing sophistication to the washroom. 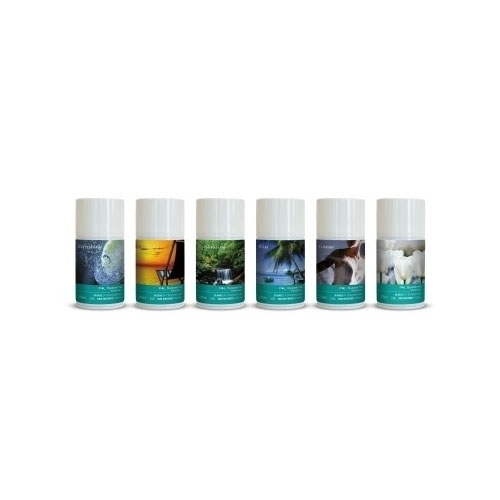 Each aerosol has its own unique blend of fragrances specially designed by leading European Perfumers to provide an experience that awakens the senses. Each of the seven fragrances uses a blend of natural oils to provide a rich, intense smell that will create an environment that has a genuine fresh, clean feel. Finesse - A fresh feminine fragrance, reminiscent of fresh linen. This delicate balance of spring like scents delivers a beautifully balanced refreshing perfume. Refreshing - A delicious refreshing fragrance, offering a rich eucalyptus base and a beautiful balance of sweet peppermint alongside sharp grapefruit and lemon scents. Elegance - A beautiful fruity floral fragrance with sparkling mandarin and bergamot, harmonised by a heart of jasmine and blackberry.